Lincoln Victor is expected to return to action for the game of the year in the Class 4A Greater St. Helens League. Victor, Union’s quarterback, has missed the last two weeks after an injury in Week 6. Victor likely could have played in Week 8 against Battle Ground. The coaches preferred to rest him for another week. “Just sit tight. If we need you, we’ll call you,” Rosenbach said. The Titans did not need him, pulling away from Battle Ground in the second half to get to 8-0. Union started 22 seniors on Senior Night. Yes, the Titans celebrated their seniors in their second-to-last home game. With Camas coming to town, Rosenbach did not want any pre-game distractions in Week 9. This week, it’s all about taking on Camas for the league title. That would be a 9-0 regular season. Union did go 9-0 in 2009 and 2008. Rosenbach said years from now, these seniors will be talking about this game with the seniors from Camas. “You always like to be on the right end of that conversation,” he said. Camas is coming off a big win but a huge loss and now must face undefeated Union for the Class 4A Greater St. Helens League title. Andrew Boyle, the team’s starting quarterback/safety/kicker who had an incredible first half last week, is done for the year after suffering a torn ACL in his right knee. Sophomore Jake Blair, who has seen plenty of action at quarterback while getting several possessions in a shared role with Boyle, is expected to step into the starting role. He was out last week with an injury. As far as Week 9, there is something special about Camas-Union. Expect a great atmosphere at McKenzie Stadium. 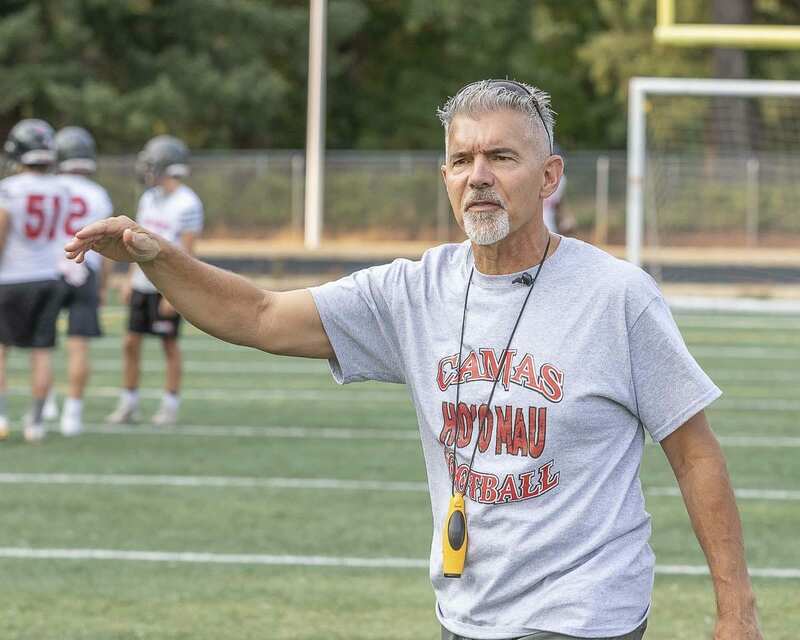 Union has “lots of weapons on offense with a playmaker QB,” Camas coach Jon Eagle said. “Great team speed on boths sides of the ball. They play physical. Lots of players with high football IQ. In fact, that started last season when Union rallied from 13 points down against Camas to win the 4A GSHL crown. Eagle also likes the staff at Union. “You don’t get to 8-0 without some good coaching,” he said. The Storm are in a must-win situation to secure the third and final playoff spots for the 4A GSHL. Naturally, just about everyone expects the Storm to win this game against a struggling Heritage squad. But still, it is very much like a playoff game already for Skyview. A loss would mean a three-way tie for third place and a tiebreaker. The Storm don’t want to worry about any tiebreaker, though. Win and in. That’s simple. It will be a little more difficult, though, without running back Jalynnee McGee. He announced via Twitter that his season is over after tearing ligaments in a foot last week. He had more than 100 yards rushing and two touchdowns in the first half against Camas but was on crutches on the sideline in the second half. Skyview is trying to get to five regular-season wins. If the Storm win on Friday, they will have secured their 13th consecutive winning regular season. And they will return to the playoffs after missing out last year. Celebrating the small victories: Raul Gonzalez, a back-up for much of the year, had to take over at a cornerback position this past week due to injuries. Then he had the game of his life for the Timberwolves with 11 tackles. Big game: The record shows it has been a struggle. There was the 2-0 start, then a rash of injuries, and the Timberwolves have been on the bad end of a streak. With all that, they have a chance at the playoffs. If they shock the rest of the 4A GSHL with a win over Skyview on Friday, they will be in a three-way tie for third place with the Storm and Battle Ground. Then those three teams will have to play a tiebreaker Monday for the final playoff berth. Is it going to happen? Even the Timberwolves know it is a tough task. Could it happen? Sure. It’s still competition. Chip and a chair is a poker reference. If a player has a seat at the table and at least one chip left in a tournament, then mathematically, there is a chance. “They have everything to lose and we have nothing to lose,” Gracey said. It was close for a half. The Tigers gave the undefeated Titans a strong effort in the first half. A seven-point game, even, until a pick-six just before halftime gave Union the momentum. Sure, it was all Union in the second half, but there is something building at Battle Ground. This team is better than a year ago. Now the Tigers get to finish the regular season with a home game against South Kitsap. It’s a chance to show their fans how much they have improved and get a third win this campaign. That would be two more than last year. Yes, the Tigers are better. 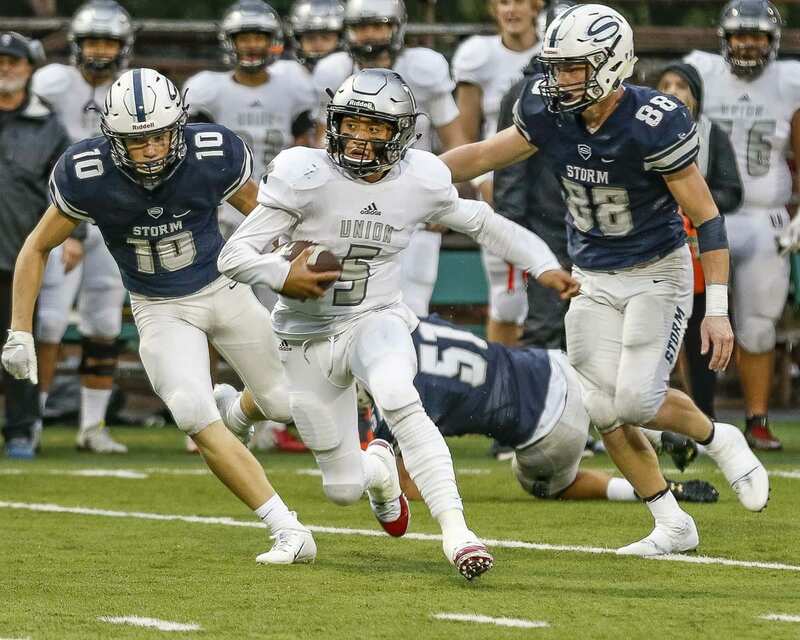 They had a strong showing against Skyview, scored four touchdowns against Camas, and gave Union a tough half of football.